Montegrappaa��s Fortuna range of resin fountain pens, rollerballs and ballpoints lends itself to personal expression. Following the application of the Skull motif is the Ca$h Pen, a wry look at Bling-Bling culture. Embracing the devil-may-care, if-youa��ve-got-it-flaunt-it excess of a world dancing to a hip-hop soundtrack, the Ca$h Pen is a showy as a stretch limo a�� only pocket-sized. Underneath the glitz is a writing instrument made for signing. 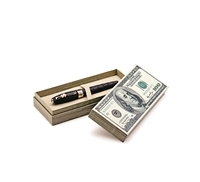 Based on the black resin Fortuna pen, Ca$h features a cap and barrel adorned with raised dollar signs. The clip, which is fitted with Montegrappaa��s roller to facilitate smooth removal from onea��s pocket, features the $-sign and cap top set with the bling-bling-iest of stones. Three trim colours are offered to accent the black barrel and the cap in palladium, rose gold and all-black ruthenium. For the palladium and the rose gold versions, clear crystals are fitted, while the ruthenium edition features black crystals a�� reminiscent of the blacked-out windows in a limo.